Well, I don’t know what it is with me and all of these superlatives, but this recipe? It deserves it. You’ll have to trust me where this cake is concerned. Firstly, pumpkin has a magical effect on baked goods. It turns the treat moist and soft and so plain delicious. 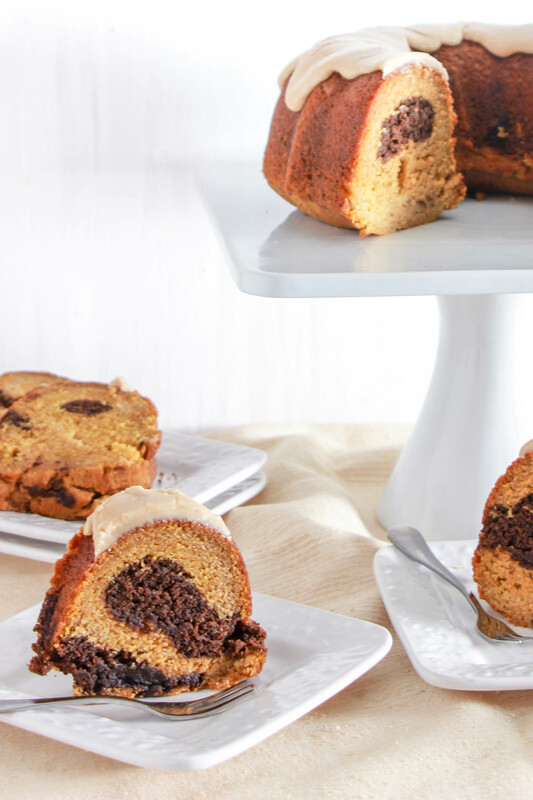 Add spices, chocolate and some other goodies, and you’re left with a bundt cake unlike any you’ve ever had before. Slather a whole bunch of sweet brown sugar glaze over the top and…are you getting the picture yet? Exactly. Just go make this. Bake the cake. Eat it. Then thank me. I know you will. By Miriam Pascal, Overtimecook.Com. Originally published in Ami/Whisk magazine. Preheat oven to 350. Grease a bundt pan well with floured baking spray and set aside. In the bowl of an electric mixer over medium speed, beat together the margarine and brown sugar until smooth. Add the eggs, one at a time, beating to combine after each addition. Add the vanilla, cinnamon, nutmeg, ginger, baking powder and baking soda. Beat to combine. Add the soy milk and beat until incorporated. Turn the mixer to low and add in the flour. Beat until just combined. Add the pumpkin puree and beat until fully incorporated. Remove a cup of the pumpkin mixture and add it into the melted chocolate. Place about a third of the pumpkin batter into the bundt pan. Top with large dollops of chocolate batter, then repeat with remaining batter. Bake at 350 for 50 minutes, or until a toothpick inserted in the middle comes out with moist crumbs clinging to it. In a small pot, melt together the margarine and brown sugar until smooth. Remove from heat and add the vanilla extract. Set aside to cool for a couple of minutes. Add the powdered sugar and soy milk to the cooled brown sugar mixture. Stir to combine. Start with 1 Tablespoon soy milk and add more, as needed, to reach a thick glaze consistency. Thanks folks for stopping by! Hope you love this cake! -Miriam PS – Did you enter to win this fabulous cookbook yet? What are you waiting for? Looks delicious. Love the combination of pumpkin and chocolate! Was a sad disaster. Heavy gross and the cinnamon a chocolate do not marry well. Sorry. I’m sorry that this cake didn’t work out for you, but without seeing what you did, I can’t know what you did wrong. Chocolate and cinnamon are actually a very well known and classic paring, and the dozens of readers who raved to me about this cake would attest to that! Tina you must have read and made the recipe backwards. Mine came out great! This is definitely a keeper! @overtimecook keep em coming! you must have accidentally put gefilte fish jelly in your recipe. My cake came out great. I am going to keep eating this cake until my dentist threatens me with 32 root canals. Cinnamon and chocolate are like two lovers. No question it should work. Are you sure you baked it right? I made this cake for shabbos and it was delicious! My whole family loved it. It was very important to follow the recipe exactly, but totally worth it!!! My sister made this for the holiday, and everyone raved about it! Even my father who is so picky when it comes to cake! Try this for thanksgiving, you won’t be disappointed. 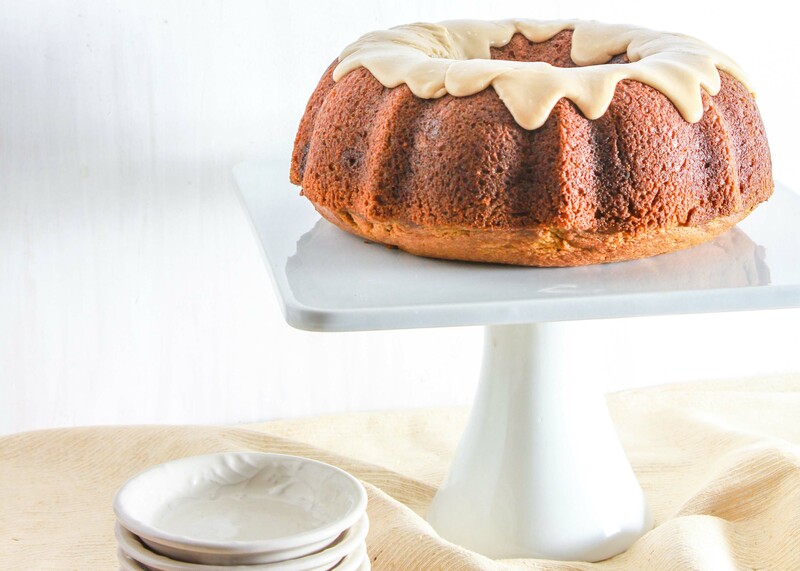 I’ve made a pumpkin/chocolate marble cake before, but this brown sugar glaze takes it to the next level! I’m going to give it a whirl this fall! BEST. CAKE. EVER. I don’t bake often, but I tried this one and it came out AMAZING. Seriously the best cake I’ve ever baked. My family loved it. Definitely gonna make this again! Hi Miriam! Seems I’ve been away from here forever. 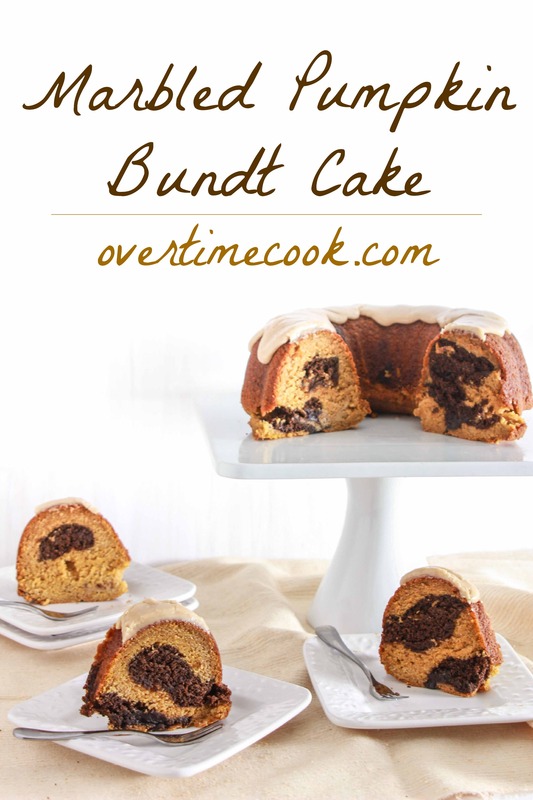 If the pictures didn’t convince me that this is one awesome bundt them Brucha’s and Shaindy’s comments certainly did. I absolutely love your blog and have tried many of your recipes. They’ve all been a hit. I was wondering if I could borrow your expertise. You see my family has a very big sensitivity to margarine or shortening and so I can’t bake with it. For cookies I substitute apple sauce and with enough trial and error I have gotten the ratio down so that there is not too much of a difference between using the margarine and apple sauce. However apple sauce does not work for things like cakes, as I once embarrassingly learned right after I got married and of course served a dense rock of a cake to a table full of guests :-O. O well, you learn. Would you have any ideas of another substitute that would work? I would love to make the cake this shabbos that you just posted. Oil should work as a substitute here. I happen to be a Huge pumpkin fan and who isn’t a chocolate fan!?!? Maybe you mixed up Tsp and Tbs??!? I would recommend you try this again.. Follow the steps very carefully. The results will be… You will have an awesome cake…. Can 2% milk be substituted for soy milk? I added chopped pecans to the chocolate part. My husband said the cake was fantastic! What kind of chocolate do you use? Bittersweet? Semisweet? Any suggestions for making these as minis? Or a different pan? Baking times? Size of pan? I hate serving everything looking the same. Because they need to be marbled, I’m not sure that minis of this is the best idea. Maybe try it mini without the chocolate layer? Hi …this recipe looks amazing and I want to make it now for Rosh Hashana but not sure about the freezing part. I’m thinking to take it out of the baking pan when it’s cool..but what do I wrap it in for freezing? Plastic wrap, foil? Freeze it airtight for best results, and glaze it after defrosting. Can i use Choc chips instead of chocolate? I’m excited to try this recipe this week. Just wondering, I pressed print underneath the recipe, and it printed out this whole page including the comments at the end, totaling 19 pages!